Filling Range: Up to 5 LTR. Suitable to Fill Various types of Liquids into Bottles. No Bottles No Filling Arrengment. Fillings done by Volumatric Principle. Diving Type Arrengment to Avoid Foaming while Filling. We are engaged in offering our clients with Semi Automatic Pharmaceutical Machinery. These precisely engineered machines are widely appreciated among our clients for their easy usage, low maintenance, and high performance. Our machines are durable and conform to the international quality standards. Keeping in mind ever-evolving requirements of our respected clients, we are offering a premium quality range of Liquid Filling Machine. 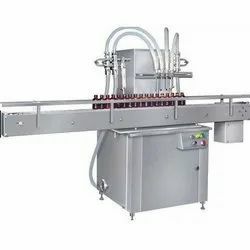 With an objective to fulfill the ever-evolving demands of our clients, we are engaged in offering a wide assortment of Semi Automatic Liquid Filling Machine. - Liquid Filling Machine is able to fill different size of bottles and pouches according to the requirement with change parts.